Two and a half years ago, when I moved to San Francisco, I had a 15-month-old and I had just left the job I most loved in the world. I was lonely and anxious and I had this tiny little seed of an idea in my head. It had to do with the books I'd been reading about Benedictines and the possibility that mothers and monks had a lot more in common than I'd ever thought. I had this thought that maybe if I could find the heart of monasticism, I might find the heart of this motherhood calling as well. So, I started writing a book, a memoir, about my life as a mom and my journey with St. Benedict. And, somewhere along that path, I started this blog, got pregnant, threw up a lot, stopped writing the book, had a baby and still didn't write the book, and moved to Austin. About six months ago, I picked up that manuscript again and have been working hard on it. I've never really mentioned it around here because I guess it felt pretentious to say, "Soooo, I'm writing this book." I don't know. I felt weird about it. But, a few weeks ago I sent a proposal to an agent I'd heard a gazillion wonderful things about. And--miraculously, beautifully, shockingly--(such grace!) Rachelle Gardner liked my proposal and is going to represent me. That doesn't mean I have book deal. But it does mean I have this amazingly bright and kind and talented advocate who wants to get this book published. And I can't tell you how giddy that makes me, how honored I feel to join the ranks of the other writers she represents, how much I feel God's good pressure on my back, pushing me into this scary and dream-like possibility. At the same time, I've been making some choices about the beautiful little blog community we have around here. I have the opportunity to move the blog to a spirituality and religion site called Patheos. Several bloggers I admire, including my friend Amy Julia Becker, are there. Moving to Patheos won't actually change much for you all. For me it will mean more opportunity to grow as a writer and more support in terms of having an intentional blogging community around. We'll make the switch on April 1st. If you have a subscription, you'll keep on getting Mama Monk. If you go to www.mamamonk.com, you'll be redirected to the Patheos site. This blog will be the same. Thankfulness will still happen on Tuesdays. Monks will still be admired. There will still be days when I talk about poetry and nobody reads it. (I kid! I kid!) The exciting thing is that I will actually change that picture on the header that's five years old. As I make this change, one other thing will be changing: my name. We all know that I have three pretty intense names. (By the way, did you know my first name is pronounced "MY-kah"? It looks like "Meesha" but it's not.) The amazing Rachelle Gardner has given me some advice that two difficult last names are just, well, difficult. So, as we make the move over to Patheos, I'm making the move to a simpler name. 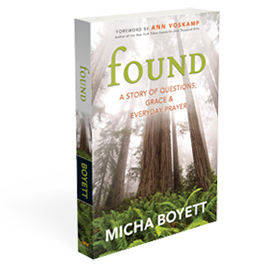 It's actually a classic from back in the day and I'm pretty attached to it: Micha Boyett. I feel a little sad to be dropping the crazy Hoho name, but I'm still Hoho in real life, and that's the best way to be a Hoho. Thanks for letting me go on and on about myself today. And thanks for celebrating with me. I feel like this is one of those rare moments when I can tell you what a gift you all have been in my life these past two years of blogging. I've always been a writer since I was penning dramatic journal entries about my 14-year-old life into my spiral notebooks. But, I never had readers until I found you. And you have challenged me and encouraged me and shaped me in the most wonderful ways. So, we'll just make some changes and they'll all be good and I'll keep being yours and you'll keep being mine.